Enlarge / US Deputy Attorney General Rod Rosenstein (C) holds a news conference at the Department of Justice July 13, 2018 in Washington, DC. 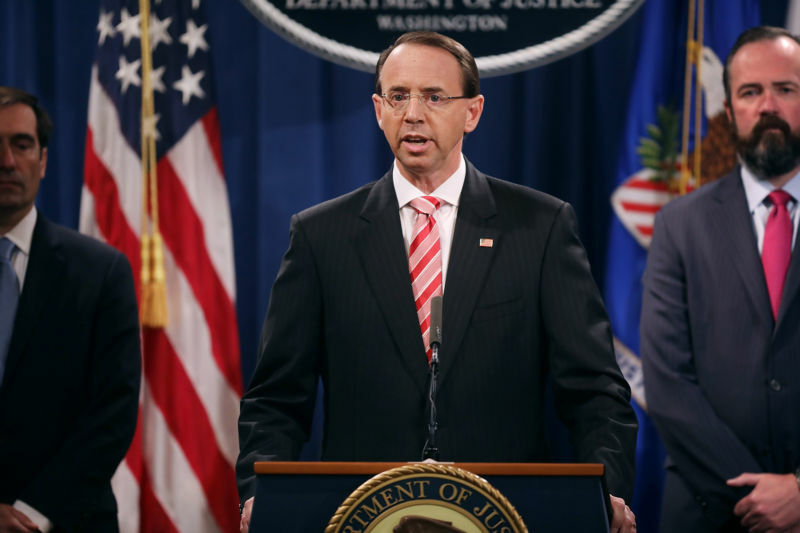 Rosenstein announced indictments against 12 Russian intelligence agents for hacking computers used by the Democratic National Committee, the Hillary Clinton campaign, the Democratic Congressional Campaign Committee and other organizations. On Friday, the Office of the Special Counsel handed down an indictment of several Russian intelligence officers that federal authorities say were critical in the operation to sway the 2016 presidential election. Given that the United States lacks an extradition treaty with Russia and that the defendants are unlikely to have many Stateside assets, what meaningful effect does going through the motions of a prosecution have? Experts say that there are a few primary objectives to this type of indictment: first and foremost, the indictment is likely to make the defendants’ lives harder if they ever want to leave Russia. Countries that do have an extradition treaty with the United States will now be on notice in case any of these guys show up. A secondary objective is to alert both the American public and the Russian government just how much the Special Counsel knows. Lawyers and former government officials were quick to point out on Twitter that by naming names, the lives of the 12 named Russians will never be the same again. The United States has been known to have hacking suspects arrested in countries ranging from the Maldives to Thailand and has also tried to lure those believed of wrongdoing to far-flung American territories like Guam. American authorities could also issue an INTERPOL red notice for their arrest. “Although it’s true that today’s indictment is unlikely to lead to arrests or other legal consequences for the named individuals, the indictment will lead to very real consequences for the individuals, most directly by limiting their ability to travel internationally, on vacation or otherwise, because of the risk of arrest,” Austin Mooney, a Washington, DC-based attorney, emailed Ars. According to Jean-Jacques Cabou, a white-collar criminal defense lawyer based in Arizona, Special Counsel Robert Mueller is laying his cards on the table by putting everything in an indictment. “So, by indicting, the prosecution can put into the public domain the facts and/or allegations found by the grand jury to be supported by probable cause (that’s a low standard, but that is the standard in question here),” he emailed Ars. Similarly, Julie Sirrs, a former intelligence officer with the Defense Intelligence Agency who now works as a lawyer in private practice in Montana, told Ars that such an indictment illustrates publicly what level of detailed investigation has already been undertaken. You are reading an article on the After indictment, Russian hackers’ lives “changed forever,” ex-ambassador says. All materials on the site Gadgets F, а также и статья After indictment, Russian hackers’ lives “changed forever,” ex-ambassador says - written for the purpose of information enrichment and we are happy if you like our magazine. Tech Talk: How Will This Year Play Out For The VR Industry?